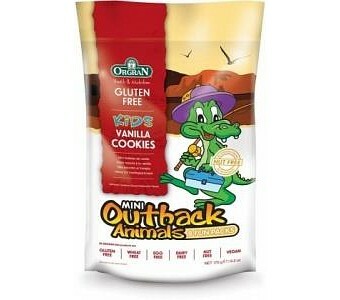 Orgran Outback Animals Mini Vanilla Cookies is a fun product made with natural gluten free ingredients and comes in 8 fun packs perfect for the lunch box. This product is rich in complex carbohydrates and has the added benefit of psyllium for extra dietary fibre and calcium carbonate as a source of non dairy calcium. 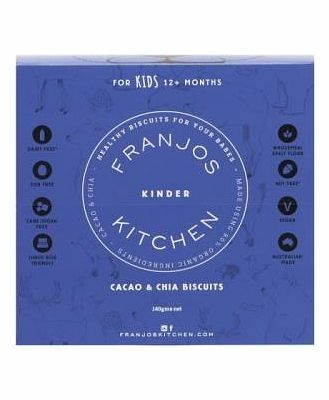 This product is produced without the addition of dairy, eggs, nuts, soy or gluten and contains over 12% dietary fibre. Ingredients: Maize starch, Raw sugar, Brown rice flour, Palm vegetable oil, Rice syrup, Pea flour, Psyllium (2%), Raising agent:sodium bicarbonate, Calcium carbonate, Vegetable gum:guar, Emulsifier:Monoglycerides from vegetable, Natural vanilla flavour (0.2%), salt.